From time to time it pays to go back to your (scientific) roots and re-read a classic. The first book I read when studying sociology was David Riesman's The Lonely Crowd and, recently, I have been lucky to obtain a 1955 abridged edition on a second hand online bookstore. To make things perfect, the book is in pristine condition and comes with the previous owner's name on the front matter with the date and location of its original purchase: New York 1955. Such are the travels of books. Where only the brave may go. David Riesman in 1953. Riesman put forward a fascinating social character study of American society over time. His account falls somewhere in between mentalite and longue duree sociology of social conduct and, in a way, his narrative can only be called prescient. His main thesis is that there are different types of characters generated by the different societies people live in. He starts with the question: why do societies get the type of social behaviour that they need to survive? It is a curious starting point, and consequently, he needs to say something about the type of society he wants his social characters to fit into. He distinguishes three ideal types (the work has echoes of Weber's work) of societies, traditional, inner-directional and outer-directional. Accordingly, there are three modes of social behaviour: traditional, inner- and outer-directed characters. In traditional societies, people live by norms and standards that are set and rarely questioned. They extend to all life domains and pervade all aspects of social behaviour. Traditional standards do not need to be logical, and obedience to them is policed and enforced through power relations. Any theory of social behaviour somehow has to deal with instances of divergence from norms or non-conformity and Riesman thinks that deviance is 'accommodated' through institutionalised roles where some sort of (abberant) individuality can be lived yet within strictly defined limits, such as the medicine man in tribal societies. Inner-directed societies are different to traditional societies in that they accomplish conformity, and thus stability of social relations, through the internalisation of norms and values. Riesman thinks that internalised sets of goals, learned throughout childhood and reinforced throughout adulthood by religous, social and political institutions, are mainly responsible for social peace in those societies. 'What is common to all the other-directed people is that their contemporaries are the source of direction for the individual... The goals toward which the other-directed person strives shift with that guidance [from others]: it is only the process of striving itself and the process of paying close attention to the signals from others that remain unaltered throughout life.' (p37). Merton's key criticism is that any all-encompassing theory of social behaviour requires a functionalist explanatory framework which allows all phenomena of social life to fit into the larger theory, something that is achieved only through disregard of much that goes on in life, or through abstraction from much of life's detail. In both cases, observations are made to fit the larger theory by neglecting much else. Consequently, large scale theories are either so general that they say little at all (ultimately failing Popper's test of fasifiability or verifiability), or can only be said to be valid by ignoring much of reality. Yet, Riesman's book is still instructive. It is an unabashed attempt to formulate a working interpretation of social behaviour and societal structures. Remember his original question: how do societies generate the behaviour they need to continue to exist? Riesman's quest strikes us as inadmissively functionalist today. Martin Hollis called this type of functionalist or system thinking 'mystical' where societies as purposive systems 'exert pressure' on its parts, the individuals (Martin Hollis, The Philosophy of Social Sciences, Cambridge: CUP, 1994, p.106). Yet, Riesman's book is a reminder of what sociological theory once thought possible and to which lengths it went to shape long duree narratives of social behaviour and its relationship with social structures. It was a bold attempt at designing a plausible structure-agency model for social conduct, its audacity acknowledged in 1954 by Time magazine when Riesman graced its cover. And it is still a great read. About two years ago I attended a concert at Liverpool's Philharmonic Hall. The main attraction was a shy young man playing the cello, who had just won the BBC Young Musician of the Year award, Sheku Kanneh-Mason. He delivered a polished performance, technically secure, at times allowing the audience a glimpse of things to come. He was helped at the conductor's pult by the firm leadership of Vasily Petrenko who is not one for musical extravangance but clear and sound delivery. What a difference a year, or two, makes. The Royal Wedding, assorted media performances later and, yesterday, the same person filled the Philharmonic Hall in Liverpool to the rafters with people who were dying to hear him (and take a picture on their iphone) at a solo performance, accompanied on the piano by his sister Isata Kanneh-Mason. As I wrote in 2016, there was never any doubt that Kanneh-Mason had the potential for cello stardom. His almost flawless technique prepared him for a steep musical career. The question was how he would navigate the stumbling blocs on the way, not least those moments of fame which were bound to come him as a rare example of a gifted black musician in a country that was (and still is) crying out for more diversity amongst its performers and audiences. As everyone knows who has been in a concert hall in the UK, auditoria here are filled with people from the same demographic: white, middle class and well into pension age, presumably a legacy of the brutal cull of secondary school music teaching in the 1980s. So it is no surprise that a country hungry for a fresh face embraced Kennuh-Mason (and his family) with open arms. Yet with fame, especially of the Royal Wedding type, come problems and it was an open question whether Kanneh-Mason would be able to walk the fine line between cashing in on the popular classical music promise and the hard slog of the concert hall performances and studios. As more recordings of him were released, the worries increased. Most of the pieces were pleasant yet musically inconsequential nods to popular taste. The real test would be whether he would develop his repertoire and further take on the modern classics, as he did with so enormous success with Shostakovich's cello concerto. The British say that the proof of the pudding is in the eating and last night, the pudding was being served and it was delicious indeed. The evening started with an dynamic delivery of Boccherini's Cello Sonata No 6. Brother and sister displayed a special rapport which helped with the rapid tempi changes and Haydnesque flourishes. The next piece was Puolenc's Cello Sonata. I must have heard it now perhaps a hundred times, most notably played by Daniel Mueller Schott and Robert Kulek. Whilst studio recordings hugely privilege the cello, as studio technicians can dim the piano sound and heighten the prominence of the cello, both cello and piano were perfectly synchronised last night and Isata Sheku-Mason took the foot of the pedal in the right moments to allow her brother to shine. Poulenc's second movement is the Cavatine, a beautiful instrumental aria. This was where technical prowess was to be transformed into personality and, whilst I would have loved a less hurried, more longing interpretation from Kanneh-Mason, he clearly put his own stamp on the piece which means he has now joined the musical conversation about the piece's interpretation in his own right, and that at age 19. 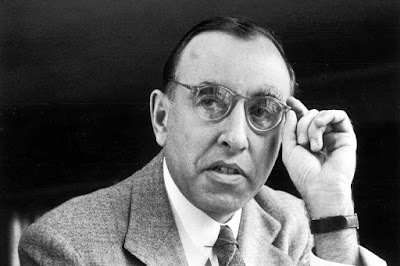 The fourth movement of Poulenc's Sonata was probably the trickiest for both to navigate and both may agree that there were moments that needed extra work still. But even in those moments of strain, if anything, Sheku Kanneh-Mason appears only to be the victim of his own success. His technique is so polished, his dexterity so extraordinary that he sometimes rushes some of the passages instead of slowing them down. Sometimes less is more, and since the first bars of the fourth movement are fiendishly difficult for the piano too, a slower pace may have worked wonders. Debussy's Cello Sonata and Brahms' Cello Sonata No 2 followed after the interval. Both brother and sister offered a muscular interpretation of Brahms, and Sheku an energic and forceful pizzicato in Debussy's Sonata's second movement. There were perhaps moments of technical brilliance that lacked the emotional urgency in Debussy but to say that is to take nothing away from a superlative performance of a promising cellist superstar in the making. I tend to close my eyes during performances since the various antics of performers (conductors and soloists alike) interest me little. Last night however I couldn't do this. Kanneh-Mason's technical skills were never in doubt but what he now offers audiences is starting to become a musical personality, a way of playing that is his very own. His famous pout notwithstanding (he has publically commented on it) his way of playing now clearly shows that he is one with his cello. More so, he dabbles in displays of full control over the instrument yet also developed a way to indicate critical distance to it. This creative tension between the player and instrument, a simultaneous unity and separation, is riveting to observe. 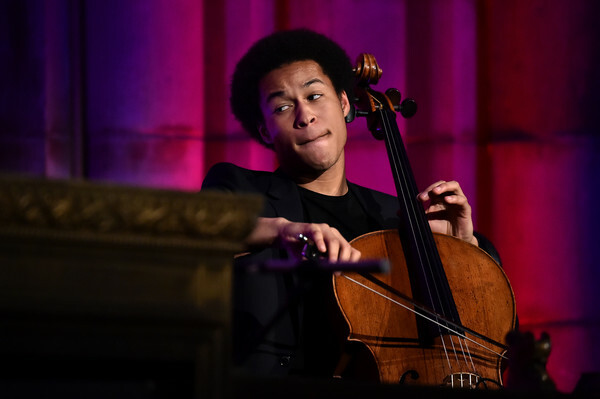 In Sheku Kanneh-Mason we are blessed with that rare thing, the career of a musical superstar unfolding in front of our eyes.